The article went on to explain with rising rates of obesity and food-related illnesses, such as autoimmune disease, the problem would only get worse. I reread that sentence and looked down at my perfect, healthy baby and it hit me like a bolt of lightning. I decided that statistics like that weren’t good enough for my child – or any child. That moment ignited a passion in me to help change those statistics and empower other parents to do the same. I knew if I could help parents understand that the power to make a change was in their hands, then together we could make a difference in the lives of our children. After all, we are raising the future generation. We can teach them healthy habits and attitudes about food, so they aren’t doomed to suffer those predicted statistics. The journey to good health started slow but rapidly grew as I saw how much healthier and happier my family was. 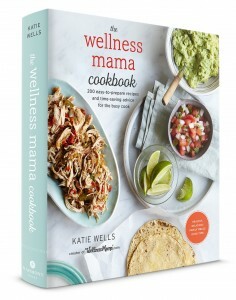 The Wellness Mama Cookbook is born out of my desire to share what I’ve learned, so other families won’t have to struggle through the same learning curve I had. I hope the recipes and advice in this book will make your life a little easier and your family much healthier. 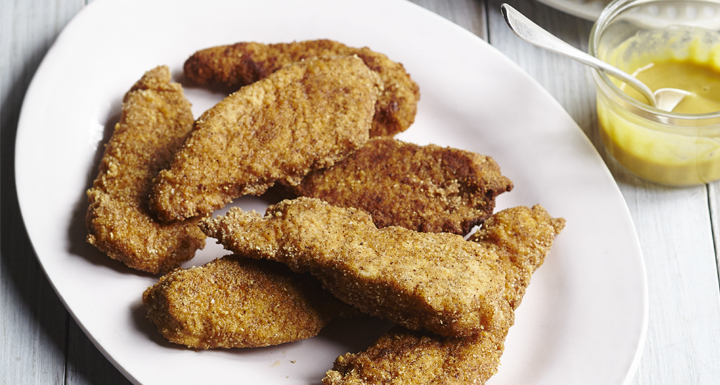 Here’s an easy way to get started with my Chipotle Chicken Fingers recipe. Chicken fingers seem to be a kid-approved food, but the traditional version with processed flour and vegetable oil is definitely not mom-approved in our house! I make a healthy version of this child-favorite by using almond flour and spices in the breading. Not to mention my kids love it! Cut the chicken into strips or nugget-size bites. In a medium bowl, beat the eggs with the water. Add the chicken strips and coat well. On a large plate, mix the flour, garlic powder, paprika, chili powder, ½ teaspoon salt and ½ teaspoon pepper. Heat 1 inch of oil in a large skillet over medium-high heat. Once the oil is hot, take the chicken pieces out of the egg mixture, dredge in the flour mixture and place in the skillet. Cook for 3 to 4 minutes per side or until golden brown and no longer pink in the middle. Remove from the skillet and place on a baking sheet in the oven to keep warm while the remaining batches are frying. When all the batches are done, sprinkle with salt and pepper and serve with the honey mustard on the side. Click for more information and to order your copy!